I attended college out of state, at Indiana University. I was home in Cleveland for winter break; that’s when I made a decision that would change my life forever. I applied for Onward Israel, an internship program, supported by the Jewish Federation of Cleveland. It was the best summer I’ve ever had. Onward Israel offers college students the chance to spend 8 weeks living in Tel Aviv and working at some of the city’s largest companies and organizations. After being accepted, I was immediately placed in a position with the non-profit organization, Latet, writing grants and research proposals. Within two weeks, I was asked to travel the country representing the organization at events and meetings. I was in Tel Aviv where everyone was Jewish and it was amazing. I was able to celebrate who I am and express my Jewishness. It was so hard to leave when my internship was over. It was the perfect opportunity to prepare me for what I was looking to do in the real world after college. 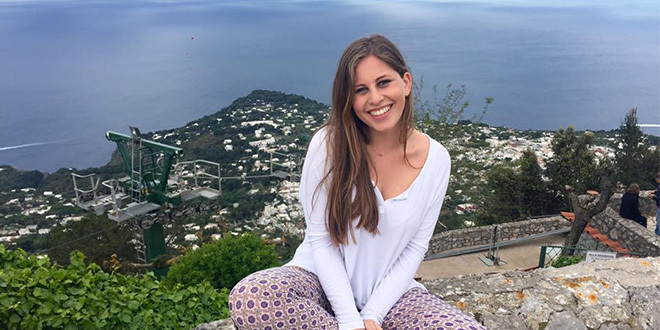 I was able to experience Israel and become deeply connected to our Jewish homeland. The next time I go there, I won’t be a tourist – I’ll know the streets, I’ll know how to get around. Onward Israel is an all-in-one package and it wouldn’t have been possible without the Jewish Federation of Cleveland. APPLY NOW! The Jewish Federation of Cleveland is now accepting applications for Onward Israel 2017. Spots are limited. For more information about Onward Israel, please visit www.clevelandonwardisrael.com or contact Mirit Balkan at mbalkan@jcfcleve.org or 216-593-2921.